In response to requests, I am publishing a brief description of my workflow here. I'm still in the process of developing a good workflow, so I can't really recommend that you use my methods. In fact, if you spot something you think I should do differently, please email me at adrienne@shutterfreaks.com. Over the past year I've been trying to pay more attention to light. For me this has been a challenge, because my natural tendency is to mentally translate a scene to what I think of as reality. To explain: if I look at a field of grass before sunrise, my tendency is to see it as green, even though under those conditions it might actually look a little blue. I also tend to overlook the differences made by the angle of the light, even though backlit objects look very different from sidelit or frontlit objects. In addition, I'm trying to learn how the camera sees light, because the camera doesn't have as much dynamic range as my brain does. In most cases I use evaluative metering (similar to matrix). I use my camera's histogram a lot to make sure I've gotten the correct exposure. If I see a graph that's heavily skewed to the left (dark) or right (light), I adjust my exposure and try again. If I see a fairly good curve, but a spike at the far right, as you see here, I know that some areas of the photo will be burnt out. In high-contrast situations, my standard procedure is to bracket my exposures, so I can use Two-Exposure Contrast Masking with Photoshop. 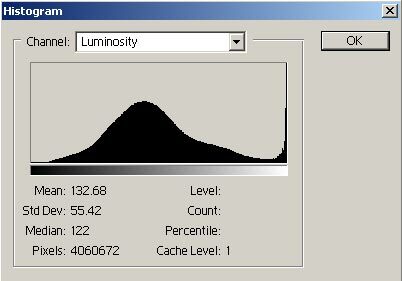 Since I can't show you my camera, this histogram is from Photoshop. I shoot in RAW mode to preserve as much information as possible. This way, I can override other camera settings, such as color matrix, white balance, sharpening, etc. at the time I convert my photos to TIFF files. Most of my shots are landscapes. Sometimes I want a shallow DOF, but usually I'm trying to maximize it, so I'm often using fairly small apertures. This necessitates slow shutter speeds. I use a tripod and the timer for these shots, to get as much clarity as possible. I also lock up the mirror to minimize vibrations. To maximize DOF, I use manual focusing to focus somewhere between the nearest and furthest objects, since the area that appears to be in focus will include objects both in front of and behind the point of focus. For more information on this subject, try a web search for "depth of field," "hyperfocal distance," and "hyperfocal point." I use a Firewire card reader to move my RAW images from my compact flash card to my hard disk. First, I determine if a single exposure can provide the dynamic range required. If not, in some cases, I may make a duplicate layer, adjust levels, and then use LMC54's Simple Two-Layer Contrast Masking. In other cases I may open one of my "bracketing" exposures, paste it into a new layer, and use Two-Exposure Contrast Masking. All these changes can be made directly to the image, but I prefer using adjustment layers because I can make changes with no loss of data. It makes it easier to find the file later. For instance, if I have a file on my website, and I decide I want to print a copy, the number in the filename helps me locate it in my data vault. After saving the file, I flatten the image and sharpen it. You might be interested in Ron Bigelow's excellent article on sharpening. By the way, I don't allow my camera to do any sharpening, because I prefer to do it myself. Now I resize for the web, making sure to check the "resample image" box. When the image is at its final size (usually 800 pixels wide for landscape mode or 700 pixels high for portrait mode), and do a small amount of sharpening. When I'm happy with the web-sized version, I put a frame around it using one of our action packages, usually (AC's Flexible Frames for Photoshop or one of our framing actions for Photoshop Elements). Then I use Save for Web to create the version I'll actually upload to the web. For more information, see Hugh's post on using save for web in the Share Your Software Knowledge forum. My computer uses RAID to protect my images against disk failure. At the end of each month, I make permanent backups of all RAW and TIFF files on an external data vault.